Your office is not only where you do business it is a statement of your professionalism and vision. Your clients and competitors will take notice if it isn’t presentable and that’s where office cleaning in London by our company comes in.Do you want to know hwy so many offices have trusted in us? 1. We do not require you to sign a contract. 2. We value all our customers – The size of the job is neither too big nor too small and we treat all with due respect and candor. 3. We accept a variety of payment methods making it easier for you to afford our competitively low prices. 4. We are flexible – You can book an office cleaning at anytime for any day and we will accept the assignment no matter the size. 5. We guarantee our services – If you are not satisfied for any reason regarding our services you have a 100% money back guarantee. 6. We offer big discounts – We offer up to 25% discounts for our regular customers. That along with our professional service keeps clients coming back. 7. We use only the best office cleaning equipment and we update on a regular basis. 8. We service to more than 6400 offices in all London towns. 9. We employ only qualified cleaners – Every person in our company must pass pre-employment tests of the utmost caliber. We test their professional skills, attitude, motivation to work, handling feedback, technical skills, and collaboration with other people on the cleaning and administrative team. 10. All our cleaners are presentable in their clean and tidy uniforms. 1. 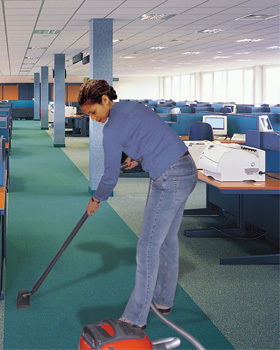 Hard Surface Cleaning – Our cleaning team will perform hard surface cleaning to all items in your office (e.g. desks, tables, ) with only safe and professional cleaning products. These products can make the old office furniture look like brand new. 2. Toilet and bathroom cleaning – The cleaner will handle and more important, will disinfect every toilet and bathroom in the office. 3. Fabric and carpet cleaning – If you have a carpet or fabric elements in the office, they will be cleaned with a high tech vapor steam cleaning machine and professional care. 4. Floor mopping – The cleaner will mop all floors with first wet and then dry mop to a gleam. 5. Final check an client approval – Our cleaner will ask for your final approval before leaving your office. My name is Agnieszka Komisarek and i own a Modelling Agency.I have 3 offices in London and the clean look on my work place is very important for me.I work with Fox Cleaners since the beginning and can't say nothing but good words.The cleaning girl comes always on time,the job is done very quickly and professional.She is friendly and reliable and deserve the tips i'm giving her.